Berkhamsted School is an independent school in Berkhamsted, Hertfordshire, England. The present school was formed in 1997 by the amalgamation of the original Berkhamsted School, founded in 1541 by John Incent, Dean of St Paul's Cathedral, Berkhamsted School for Girls, established in 1888, and Berkhamsted Preparatory School. 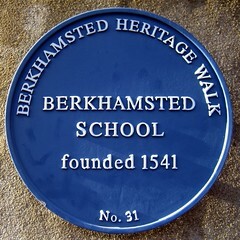 The new merged school was initially called Berkhamsted Collegiate School, but reverted to Berkhamsted School in 2008. In 2011 Berkhamsted School merged with Heatherton House School, a girls' preparatory school in Amersham, to form the Berkhamsted Schools Group. The Group acquired Haresfoot School in Berkhamsted and its on site day nursery in 2012, which became Berkhamsted Pre-Preparatory School for children aged three to seven, and Berkhamsted Day Nursery. Berkhamsted School is a "diamond school" in which pupils are taught coeducationally in the Pre-Prep School, Prep School and Sixth Form, but independently in the traditional Senior years, between the ages of 11 and 16. The school has four main sites: the Pre-Prep School, the Prep School, the Castle Street Campus and Kings Road Campus (the latter two being the original boys' and girls' schools respectively). The School is noted for its distinctive collegiate and pastoral structure, a varied sporting, outdoor education and cultural co-curricular programme and participation in the life of the local community. Mr Richard Backhouse, previously principal of Monkton Combe School, became Principal of the School in January 2016.